Corson on the job as Director of BOASI, circa 1938. SSA History Archives. 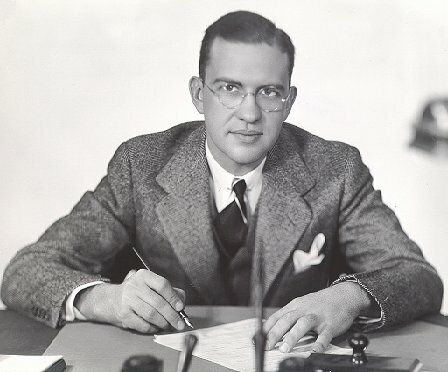 A 1926 graduate of the University of Virginia, John Corson began his association with Social Security as Assistant Executive Director of the Social Security Board in 1936-38 and he served as the Director of the Bureau of Old-Age and Survivors Insurance first in 1938-41 and again in 1943-44. Mr. Corson served as Deputy Director of the U.S. Employment Service and worked for the National Youth Administration, National Recovery Administration, and United Nations Relief and Rehabilitation Administration. Following his years of Government service, in 1946 he joined the Washington Post Staff for 5 years before becoming a partner in a private management consulting firm in Washington, DC. He returned to Government service as an advisor to the Secretary of Health, Education, and Welfare from 1966 to 1968 and later acted as a consultant to foreign governments and international organizations; taught at the Woodrow Wilson School of Public and International Affairs, Princeton University; and authored a number of books and articles on government and administration. He was past president of the American Society of Public Administration. John Corson died September 2, 1990, in Arlington, Virginia. He was 84 years old.